The letter F in our festive overview of iconic chairs is represented by French designer Jean Prouvé's Fauteuil Direction armchair. Fauteuil Direction is one of Prouvé's most recognisable furniture designs and demonstrates aspects of his innovative approach to material usage and manufacturing. Designed in 1951, during a period when Prouvé was operating a factory on the outskirts of the city of Nancy producing his own furniture and prefabricated buildings, the chair is one of several pieces he developed using a new technique for forming sheet steel. The back legs are made using this metal-bending process, which Prouvé employed to maximise the metal's strength while reducing the amount of material required. 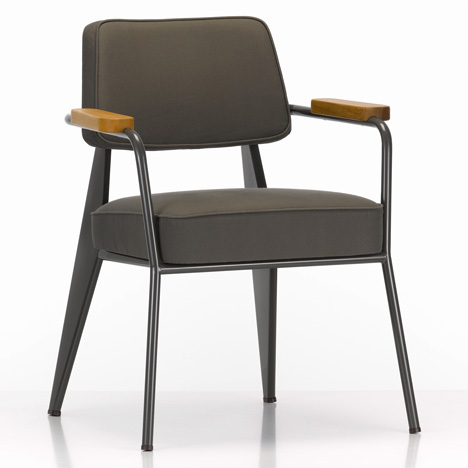 Tubular steel front legs curve towards the seat-back and support armrests that can be specified in oak or walnut. The two upholstered cushions that form the seat and backrest create a soft point of contact for the body that contrasts with the harder materials used for the chair's structure. Since 2002, furniture brand Vitra has been reintroducing Prouvé's furniture designs and last year it added the Fauteuil Direction armchair to its collection. Jean Prouvé was born in Paris in 1901 and trained as a metal artisan before opening a workshop in Nancy where he produced his own lightweight metal furniture designs. During the Second World War he manufactured wooden furniture and prefabricated houses, such as a building from 1945 that was put on sale at last year's Design Miami fair for $2.5 million. Prouvé later lost control of his factory and went on to focus on more experimental architecture projects including pavilions, housing and schools, led by his strongly held social values. From 1968 until his death in 1984 he ran his own architectural consulting firm in Paris and was an important member of the competition jury that selected Richard Rogers and Renzo Piano's design for the Pompidou Centre.